The Augsburg Confession, also known as the "Augustana" from its Latin name, Confessio Augustana, is the most important confession of faith of the Lutheran Church. The Augsburg Confession is normative to all Lutheran Churches everywhere and in all times. It is also one of the most important documents of the Lutheran reformation. 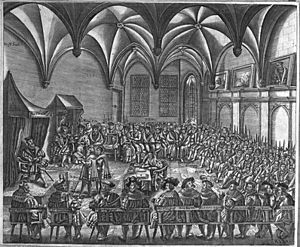 The Augsburg Confession was presented by a number of German rulers and free-cities at the Diet of Augsburg on June 25, 1530. Augsburg Confession Facts for Kids. Kiddle Encyclopedia.